Paul Kruger, President of the Zuid-Afrikaansche Republiek (ZAR) officially set aside 250,000 hectares of land in the 'Lowveld' as a 'government reserve' on 26 March 1898. The fledgling reserve became known as the Sabi Game Reserve. The reasons for the reserve were many; however, conservation as we know it today (the protection of nature for its intrinsic value) was not one of them. For many years it had been apparent that wildlife, which formed a foundation of the Boer republic's economy, was dwindling. The Volksraad, the governing body of the ZAR, was empowered to declare areas of state land closed to hunters. In actual fact, the primary reason for the initial proclamation of this reserve was to provide a 'game reserve' where wildlife could breed so that it could later be shot. The initial custodians of the reserve were two policemen. Effective control of the reserve was lost during the years of the war between the British Empire and the Boer republics (1899-1902). Major James Stevenson, intelligence officer in the sixth Inniskilling Dragoons, was appointed warden after the war. When Stevenson-Hamilton arrived in the Lowveld in 1902 he found very little wildlife there to protect. He immediately set in place measures to curb the rampant poaching by the local white and black inhabitants. His devotion to the survival and furtherance of the new reserve bordered on an obsession. In 1903 the boundary of the reserve was extended 20 kilometres to the west and the colonial administration created the Shingwedzi Game Reserve in the northern part of the Lowveld. This reserve comprised of 500,000 hectares, between the Limpopo and Letaba rivers. Stevenson-Hamilton was put in charge of both reserves. The area between the Sabi and Shingwedzi reserves was comprised of private farms owned by large land companies but nominally occupied by them. Stevenson-Hamilton negotiated a leasing arrangement whereby the private farmland effectively became part of the Sabi Reserve. He therefore gained control of what was to become, decades later, the greater Lowveld conservation area. Stevenson-Hamilton's uncompromising opposition to hunting in the reserves earned him respect but few friends. In 1914 Stevenson-Hamilton rejoined the British Army in France for the duration of World War I. During his absence the Union government deliberated on the future of the reserves. Since game hunting was no longer a mainstay of the economy in South Africa, the idea of the game reserves had lost its original purpose and there was pressure to make the area available for farming. The reserves were expensive to maintain, generated no revenues, occupied land potentially useful for other purposes and harbored dangerous animals. Pressure mounted to have the reserves de-proclaimed. The survival of the Sabi and Shingwedzi reserves was achieved via a new, radical idea: the national park. The national park, as it was conceived of at the beginning of the 20th century, had an aesthetic rather than economic justification. This idea excited the South African public. Stevenson-Hamilton, impressed by the success of national parks in the United States of America, lobbied for a more permanent status for the Lowveld reserves. However, nothing happened in this regard for many years and pressures from farmers, mining houses and land companies continued to seriously threaten their existence. In 1926, the new Minister of Lands, Piet Grobler, grand-nephew of Paul Kruger, championed legislation in parliament for National Park status for the reserves. 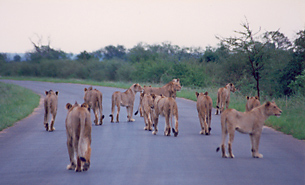 It was at this stage that the name 'Kruger National Park' was suggested. The bill was seconded by the opposition leader, General Jan Smuts, and was passed with acclamation. On 31 May 1926 the National Parks Act was promulgated and the Kruger National Park became its first protected area. Counting from the proclamation of the Sabi Reserve in 1898, the Kruger National Park is the second oldest formally-conserved area in all of Africa and, at nearly two million hectares, one of the largest. The area proclaimed as The Kruger National Park was made up of certain parts of the Sabi Reserve (the area which now makes up the Sabi-Sands, Timbavati and Klaserie private nature reserves was excised), and the Shingwedzi Reserve, as well as the privately owned farms and state land between them. The basic form of the Park has remained essentially the same, with some minor boundary adjustments, ever since. The human population of the Lowveld at the time of the Park's proclamation was probably at its lowest point ever. The human economy depended upon cattle and wildlife and the Lowveld was rife with 'nagana', a fatal disease of cattle carried by the Tsetse Fly. The wildlife decimation in the area started by hunting was completed by rinderpest, a virulent disease of cattle and wildlife that originated in Asia and swept through eastern and southern Africa between 1896 and 1898, killing about 95 percent of the cattle and related antelope species, such as Buffalo, in the areas affected by the disease. Ironically, with the rinderpest epidemic and demise of the cattle and wildlife, the Tsetse fly was also eradicated in the Lowveld. The development of effective prophylactics against malaria in the 1930's, combined with new and effective use of insecticides, such as DDT, to combat mosquitoes, was the final step which opened up the Lowveld for human development. The twentieth century has seen the Lowveld transformed from an inhospitable wilderness into a region of high human population and significant economic activity. Most of the land occupied by the Kruger Park is too arid or infertile to support crop agriculture and its value as a tourism venue far exceeds the income that could be expected from cattle ranching. The Park has become the core of a vast natural resource management area that includes privately and communally owned protected areas, as well as reserves in the adjacent countries. Tourism is fast becoming a foundation of the South African economy and the welfare of the people is once again dependent upon the variety and abundance of the African landscape and biological diversity. There are several flights a day between Johannesburg International Airport and the Skukuza landing strip. Visitors may enter the Park at any of the various gates; but the gates are only open during daylight hours. Visitors must also be able to reach their overnight accommodation within the Park by sundown. Visitors who arrive at their camps after sunset may be fined. Vehicles must have a solid roof and visitors are not permitted to leave their vehicles except in the rest camps and at designated locations within the Park. Accommodations consist of a range of huts, cottages and tents of different sizes and degrees of luxury. Visitors may park caravans or set up tents in the campsites, or they may use one of the permanent 'safari' tents. Basic groceries, alcoholic and non-alcoholic drinks, clothing and curios are available from shops in the various rest camps. Most rest camps also have a restaurant where breakfasts, lunches and dinners are served and drinks and snacks are available in between meal times. The Kruger National Park is flanked by several privately owned wildlife areas (see our Map of Lowveld Reserves) which offer luxurious accommodation and very personalized service. Kruger's 7,523 square miles (19,485 square kilometres) make it nearly the size of the state of Massachusetts. The Park is 55 miles wide at its widest point and 220 miles (355 km) long. The Park had always been totally fenced until fairly recently, when the fences separating the Timbavati and Sabi Sand Reserves were taken down, effectively increasing the size of the reserve by 15 percent and allowing wildlife greater freedom of movement. However, the annual winter migration routes of antelope, zebra and various other species in search of water and better grazing are still cut off by fences. Several hundred windmills and artificial water holes have been constructed to provide the water so desperately needed in the dry season. The most popular area in South Africa for wildlife safaris for international visitors is the private reserves that lie along Kruger National Park's western border, possibly followed by Kruger National Park itself. There is a tremendous difference in the variety and quality of experience between visiting Kruger National Park and experiencing the adjacent private reserves. In Kruger, which has over 500,000 tourists each year, only closed vehicles are allowed and off-roading is strictly prohibited. Night game drives can only be conducted by Park rangers in large Park vehicles; night drives in private vehicles are not allowed. Facilities in Kruger are fair. In the adjacent private reserves, day and night game viewing is conducted in open safari vehicles, walking is permitted and facilities are excellent. Essentially, visitors to the private reserves have a greater opportunity to experience the bush than they would in Kruger. However, staying in the private reserves is far more expensive and Kruger Park does offer fantastic opportunities to see the exact same game as in the private reserves. The Kruger National Park contains an incredible diversity of plants and animals as follows (number of species given): Mammals-147; Birds-492; Reptiles-118; Amphibia-34; Freshwater fishes-49; Trees and shrubs-404; Grasses-224; Other plants-1,275. Africa's Top Wildlife Countries by Mark W. Nolting. 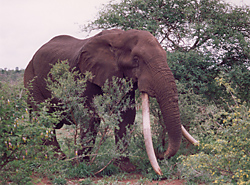 The photos above are James', from his November 1995 visit to Kruger.